Fast & Furious is a high-speed racing game for the iPhone and iPod touch released by I-play that hit the App Store around the time the movie of the same name hit the big screen. The game follows the movie pretty closely with several of the missions essentially being reenactments of the movie’s key scenes. A Little Pick-Me-Up: You’ve got an NOS canister to tap for a boost of speed in Fast & Furious. Otherwise, you steer your car by tilting your iPhone left or right. To start the game, you pick from Quick Race, Story Mode, Compete Online or WiFi Multi player. 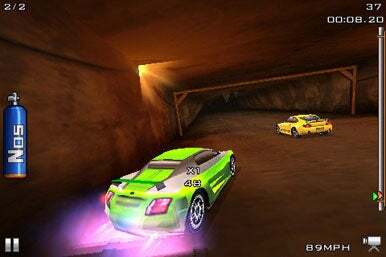 Quick Race offers seven different type of racing—Road Race, Drift Race, Drag Race, GPS Race, Tunnel Run, Pursuit, and Evade—which also appear in Story Mode. Each option is distinctive. In Drag Race, for example, you have to shift gears at the right time by tapping the tachometer and using nitrous boosts to defeat your opponent. (The steering is automatic.) In Pursuit, your objective is to chase down and destroy target cars by smashing into them or ramming them into walls. In GPS Race you have to make it through checkpoints before time runs out. All these different modes of play are sure to keep you coming back to the game without getting bored. Story Mode, provides nine levels consisting of events or tasks you must complete before you can move on to the next challenge. Fueling your desire to be successful at these tasks is the fact that the pink slip for the car you choose to use is on the line. In other words, lose the race, and lose your wheels. A victory means you add your foe’s car to your garage. Acquiring new cars is crucial to future tasks since each car has different stats that make it suitable to certain types of challenges—drifting, drag racing, road racing and so on. If you find yourself really needing that car you’ve lost, you can always go back and try to win it again. Competing online adds an entirely different dimension to Fast & Furious. You can race any track you have previously unlocked in Story Mode and have your time uploaded to the Cloudcell server to see how well you stack up against the rest of the world on the leaderboards. You’ll need to create a profile at Cloudcell.com first—an easy process you can take care of from within the app. Once you’ve signed up, you can upload video playbacks of your races and view your rankings. Another great feature of competing online is Ghost Racing. This allows you to challenge anyone on the leaderboards in a race against their uploaded video. As you race, you can see the opponents ghost car from the uploaded video speeding along so you know if you’re ahead or falling behind. Just keep in mind that these challenges are for pink slips, so don’t go challenging the world’s best, unless you don’t mind losing your car. On the other hand, if you feel confident in your racing skills, this can be a great way to fill your garage with new cars. A Wi-Fi mode lets two iPhones link up on a shared connection to race against each other for pink slips. You steer in Fast and Furious by tilting left or right; there’s also a NOS canister to tap for a boost of speed. The steering controls are little sensitive and take a while to get used to so don’t expect to just pick up the game and instantly climb to the top of the leaderboards. You won’t find a gas pedal because of the auto accelerate feature, while braking is done by tapping anywhere on the screen. The graphics in Fast & Furious are pretty impressive and the audio is pretty good as well, though there doesn’t seem to really be a cool soundtrack to listen to while you race like you may expect in a racing game. Fast and Furious really has a lot of depth. Between the multiple types of races, the story mode, and the online features, you’re sure to get your money’s worth—especially with the app on sale for $2 at the time of this review. A free version of Fast & Furious also gives you a taste of the game’s full capabilities. Fast & Furious The Game is compatible with any iPhone or iPod touch running the iPhone 2.1 software update.